Buildings – landmarks and monuments – in vandalism-prone areas such as Panepistimiou Street and around Omonia are once again acquiring their original color and glow after being stripped of graffiti and ‘tags’ without aesthetic value. The Municipality of Athens is soldiering on with its ambitious cleaning program, keeping a low profile, following the targeting of the ancient cemetery of Athens at Kerameikos. Local authorities are urging citizens, institutions and private businesses to maintain the surfaces, keeping them clean. 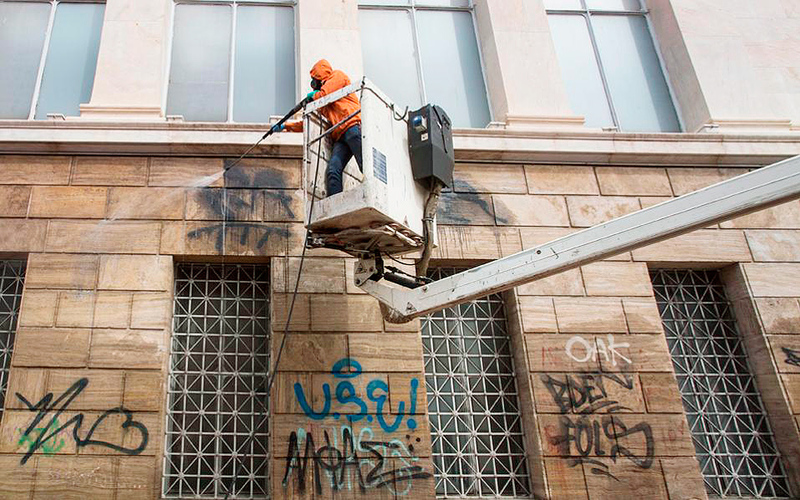 The organization that has assumed the responsibility of cleaning the defaced areas around the Municipality of Athens is 2G Facility Management, in partnership with Booka chemicals company, that specializes in graffiti removal. On Wednesday, cleaners, in collaboration with the municipality, worked on the National Library free of charge. In the past, the same was done for the Athens Academy, the Numismatic Museum of Athens, Athens Polytechnic and Pnyx Hill. “The material we use is biodegradable and environmentally friendly, and is used for the cleaning of monuments around the world,” say Ilias Andreopoulos and George Karyotakis, founders of Booka. The specialized cleaning crews spread a layer of chemicals in the first stage of graffiti removal so as to begin initial work, whereas they subsequently remove the “traces” of graffiti left in the second stage. Following the procedure, a layer of chemicals is applied so as to preserve the wall from future vandalism attempts for at least the next ten years. “If someone else applies spray paint on the wall, then it is easy to remove simply by applying water pressure,” explains Andreopoulos. The same concept is used when cleaning street signs that are usually covered in layer-upon-layer of stickers and posters. “The stickers are not able to remain on the surface. They are stripped off, easily, by hand,” he notes. 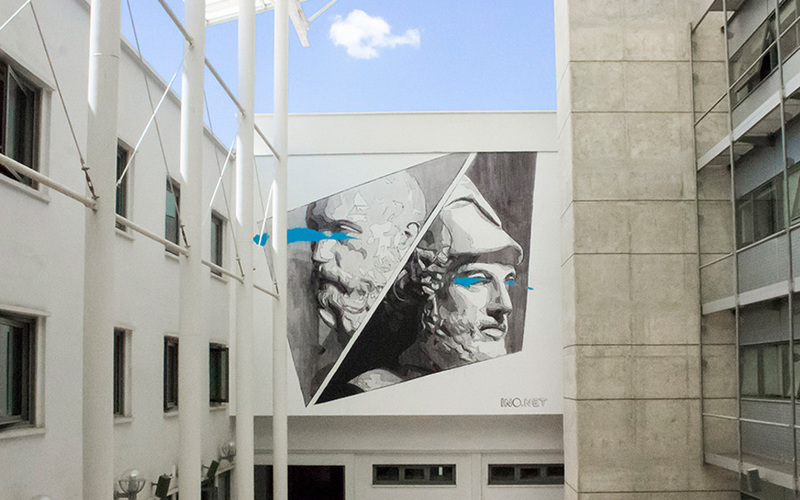 The Parliament of Cyprus was recently adorned with a mural of Solon and Pericles – ancient representatives from the birth of democracy – spray-painted onto the walls by INO, an internationally-renowned Greek graffiti artist. The same artist has graffiti displayed on the walls of Greece’s health care insurance branch (EOPPY) on Pireos Street and the facade of the Onassis Cultural Center, where one of the artist’s most well-known works occupies a prominent place on the building. In recent years, large murals have been a trend followed by talented artists around Greece wishing to give color, design and meaning to walls of buildings and industries, such as the Titan factory in Thessaloniki. A number of these artists are ‘veterans’ when it comes to street graffiti that has little in common with the sports or political slogans and so-called “tags” that deface statues, monuments and historical buildings. “Our products also protect these types of artistic works from others wishing to spray over them,” notes Karyotakis.